Bryan Electric provides Gainesville, GA residents with access to experienced professionals well-versed in a variety of electrical services and repairs. Our team of professional electricians caters to the needs of our customers, first and foremost. We’re ready for everything from exterior upgrades to complex interior jobs. At Bryan Electric, we use the most advanced technology available to examine your electrical issues and provide you with effective, affordable solutions. We will work with you to stop malfunctions afflicting your electrical system. We’ll even help you keep them from returning with our preventative maintenance plans. Whether you need electrical service in a commercial space or your personal residence, we have the resources to help. Our tools even include thermal imaging technology that will help us extend the lifespan of your system’s components, keeping them running better for longer. We also understand how important it is for your business’s electrical system to run smoothly. This is why we strive to discover potential issues before they cost you valuable work hours. We can even assist you with downsizing your utility costs through our energy audits, which identify the causes of wasted energy and allow you to address them before they become expensive. 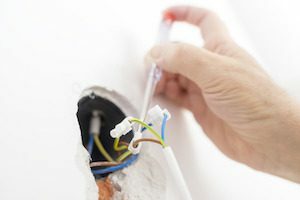 Are you seeking electrical repairs in Gainesville? If speed is what you need, Bryan Electric has the solution you need! We offer 24-hour emergency electrical services for our customers, as well as fast response times when you’re in need of non-emergency help. Our service brings you the assistance you need without keeping you waiting. We also make sure you know what our rates are before we get started, so you are never surprised by a bill you can’t afford. We’ll even tell you when you can expect our experts to arrive. Although we’ll always do our best to get your repairs done quickly and affordably, our services go beyond responding to electrical issues. We also focus on preventing the issues in the first place with our preventative maintenance plans. We’ll look over your system and identify which changes and upgrades are necessary so you can avoid the hefty price tag of future repairs. We can remedy small issues early, long before they can develop into real problems. If you need new equipment, we are more than happy to use our expertise to help you select the option that best fits your needs. To learn more about our electrical services and repairs in Gainesville, GA, give us a call at (770) 680-2144 today.